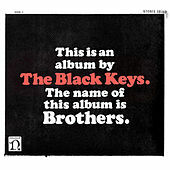 Since 2008's Attack & Release, Dan Auerbach went solo, Patrick Carney formed Drummer, and both collaborated in the hip-hop/rock group Blakroc. It's all been nothing but inspiration for the Akron natives, who are starting to sound like true Southern boys. They open with the funky shoop of "Everlasting Light"; bring back Danger Mouse for some R&B swagger on "Tighten Up"; and cover Jerry Butler with "Never Gonna Give You Up." It sounds like the Keys boogieing with the ghosts of blues and soul. Then again, maybe they were: Brothers was recorded at the legendary Muscle Shoals Studio.